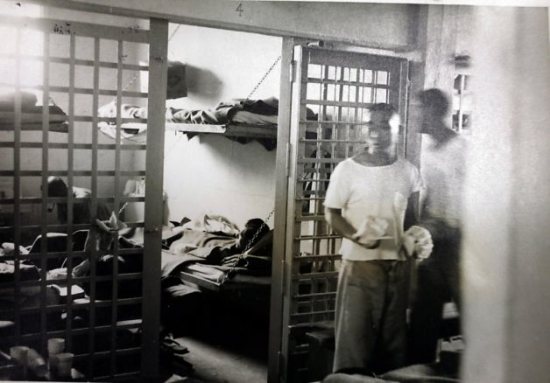 A 1945 photo of the Tule Lake Segregation Center’s jail, a prison within a prison. TULELAKE, Calif. — After World War II, the Tule Lake Basin community of Newell, Calif. was left with a unique landscape. Between 1942 and 1946, more than 29,000 Japanese Americans were imprisoned in the Tule Lake War Relocation Center or Segregation Center in Newell. The infrastructure used to hold the Nikkei was made available to the local population for use in their efforts to rebuild their lives in the aftermath of the war. The infamous segregation center jail, a powerful symbol of the injustice inflicted upon so many, was considered valuable in a landscape where metal was difficult to obtain or expensive to buy. Like much of the former camp, the metal used in the jail was sold by the Bureau of Reclamation as scrap. The purchasers, however, had the foresight to protect these pieces of history. On Aug. 30, the Tule Lake Unit of World War II Valor in the Pacific National Monument was pleased to accept a donation from Bill Osborne and family of significant portions of the Tule Lake Segregation Center jail’s metal infrastructure, including cell bars, doors and bunks. Due to the forward thinking of Bill’s mother Allison M. and father James Edgar Osborne more than six decades ago, these historic artifacts have been preserved. Mrs. Osborne had a long history of helping Japanese Americans discover their history at Tule Lake, according to her son. Bill recalls his mother spending time at the segregation center helping teach in one of the elementary schools and providing fresh vegetables. The Tule Lake Unit of World War II Valor in the Pacific National Monument, along with partners such as the Tule Lake Committee, are working to make management decisions on how best to preserve the existing structures and interpret the events surrounding the segregation center. The Tule Lake Committee is raising money to help protect what remains of the jail building. Established in 2008, the World War II Valor in the Pacific National Monument is a nationally significant site dedicated to telling the story of the cost of war on the home front and the lasting effects of the unjust incarceration of over 29,000 U.S. citizens and long-term residents of Japanese ancestry at the Tule Lake Segregation Center. For more information about visiting the Tule Lake Unit, call (530) 260-0537, email [email protected], or go to www.nps.gov/tule. 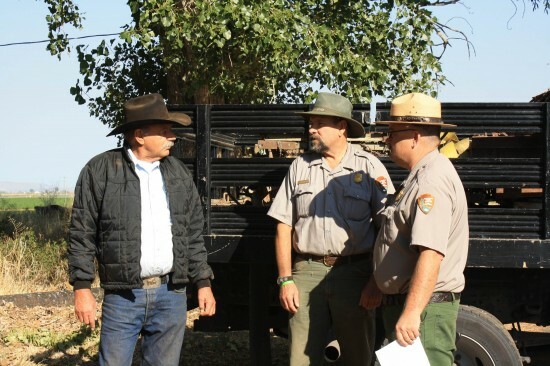 Tulelake farmer Bill Osborne (left) confers with Tule Lake park rangers Don Bowen, chief of maintenance, and Terry Harris, chief of visitor services. In the truck are the donated jail bars.